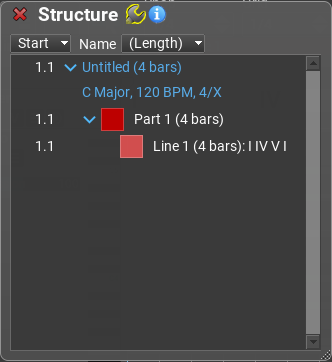 This tutorial explains how you can set up a composition, and set basic properties like scale, tempo, signature, and how to use the structure editor. Press the 'Files' button: . 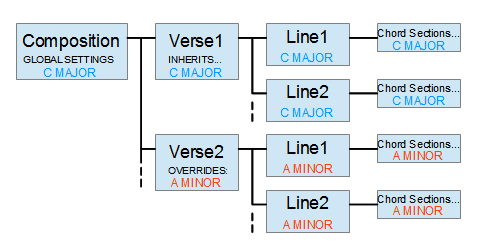 The composition structure is presented as a collapsable list in RapidComposer. Click on the 'Structure' icon to open the Structure Inspector. 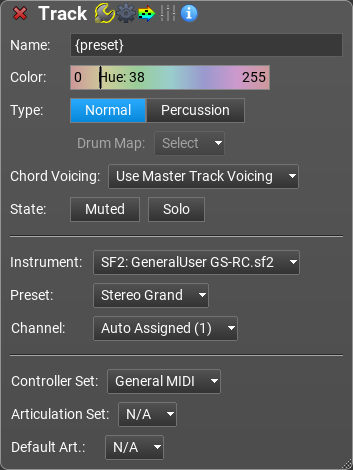 You can set the composition global scale, tempo and signature in this window, as well as composition title and composer name. You can choose whether to use absolute chords, or chords with scale degrees. The active view (that you edit on the composition workspace) is displayed with blue text in the list. By default the whole composition ('Untitled' on the screenshot) is displayed. 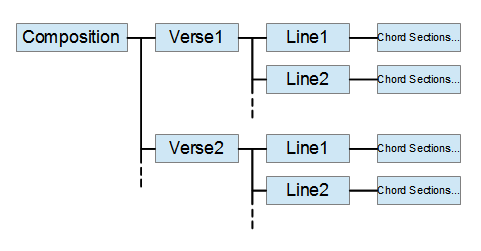 Double-clicking on 'Line1' will display only 'Line1' in the composition workspace. 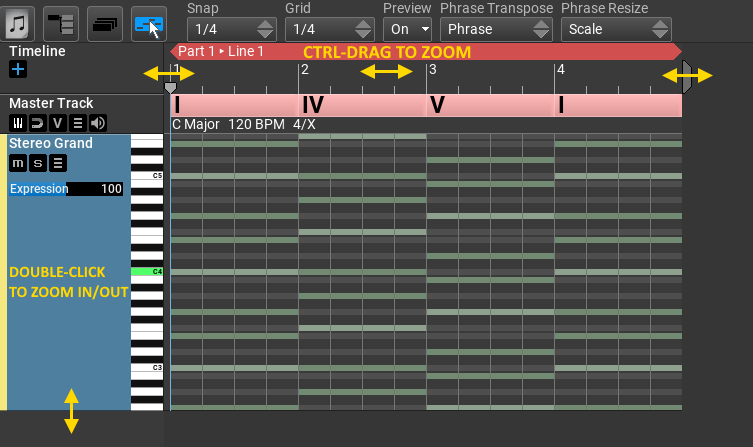 Hint: if you press '+' the track is automatically zoomed to fill the workspace. 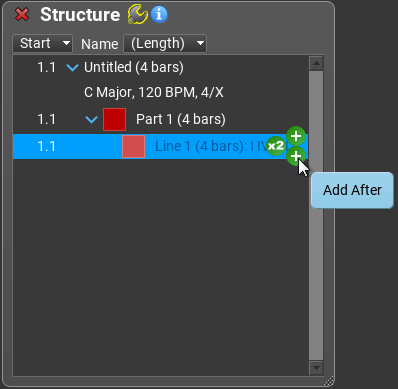 Right click on a track header to open the track inspector, where you can set the name, colour, instrument, articulation ad other properties for tracks. 'Track Hints' is important: it will specify if the track should use acoustic guitar chords, or the track is a percussion track. If guitar chords are chosen, the track will look up the master track chord from a guitar chord database and use the guitar chord notes instead of the keyboard chord notes. This tutorial ends here, but there is still a lot to discover. 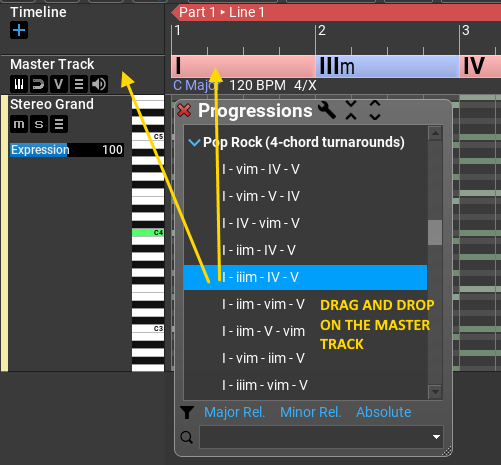 Generally if you right-click on a track, phrase, master track, transport buttons, etc, an inspector window will open. At the top of the window you can choose whether to display the properties, operations or help for the clicked object. If you leave the mouse over a UI element, a help window will pop up. (You can turn off pop-up help in the settings when not needed anymore.) At the left bottom corner of the window you will find two small buttons that provide information about mouse operations and keyboard shortcuts.